Charles Henry Phipps was born on 3 December 1889 at The Pike House, Perryway, the son of Henry Phipps, a labourer, and Mary Ann née Cartwright. He was privately baptised by the vicar of Frampton on 16 December the same year, and then received into St Mary's church on 12 January 1890. Shortly afterwards the family briefly moved to the Bristol road (just into Eastington parish), before returning to Frampton to live in The Street. In 1911 Charles was a confectioner in Gloucester, boarding with another confectioner, Albert Taylor; however, our photograph with his 'biography' suggests that he was also a taxi driver at some time before the War. On 22 September 1914 Charles enlisted at Gloucester, being certified as suitable for service in the Royal Gloucestershire Hussars Yeomanry. On 3 April 1915 he married Edith Emma Whiting at St Lawrence's church, Barnwood, while serving as a trooper in the RGH. 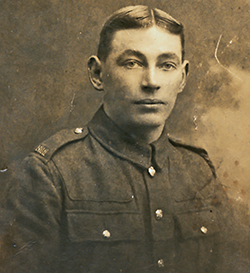 He appears to have remained in the UK until 19 October 1917, unfortunately the crucial part of his service record is badly burnt, so although he was 'posted' twice, we do not know to which units. However, in October 1917 he arrived in Mesopotamia where he certainly served, and probably from the outset, as a private with the Machine Gun Corps (Cavalry). The next event on his records was his admission to 33 BG Hospital Makina Masus, near Basra, on 10 January 1918 with a thumb injury from a month before (not incurred while on duty); this was assessed as 'not affecting his future efficiency as a soldier'. Family members have related that later a shell was said to have exploded next to him, burying him in the sand with two comrades from which incident he was the only survivor (which may account for the state of his wallet, pictured in our Gallery). It is believed that this event may have caused what was known as shell shock and this, quite naturally, had a profound effect on him. Today the condition is known as post-traumatic stress disorder; it is recognised as occurring in both civilians and Service personnel in emergencies and operations, and is sympathetically treated. During and after WW1, however, treatment was seldom kind. The records relating to Charles' repatriation are indistinct, but he was admitted to Dykebar War Hospital in Paisley, and then discharged as not physically fit for military service on 17 June 1919. Charles was awarded the Silver War Badge and his family report that he convalesced in Standish VAD Hospital with his wife often visiting. By January 1920 he was corresponding with the Army about his British War Medal, Victory Medal. His service is commemorated on the plaque in Frampton Village Hall. Charles and Edith had three children: Leslie, Barbara (Peggy) and Raymond. For some time he worked as a gardener for Mabel Constance Clifford. The family lived in Greycroft and later in one of the cottages that were formerly on the site of Bendles, both in The Street. Charles Henry Phipps died on 3 July 1972 at his home in King's Stanley (a bungalow he named 'Frampton'), surrounded by his family, having spent the final years of his life being cared for by his son and daughter-in-law, Leslie and Edith. He was buried in St Mary's churchyard three days later.